The Castro brothers of Cuba have been running spy operations inside the United States for decades and only a few have been detected and caught. The FBI has a division devoted to tips, clues and investigations for tracking the evidence and bringing prosecutions. It is tedious work, after all, it is a clandestine craft on both sides. Cuba has a revenue base of selling intelligence and the global buyers include Iran, Russia, China and even Syria. In 1998, a group of ten Cuban spies were arrested. Ten people were charged in the largest Cuban spy ring ever uncovered in the United States since Fidel Castro came to power nearly 40 years ago. According to the FBI, the spy ring had been under surveillance in south Florida for three years. The eight men and two women tried to penetrate U.S. military bases, infiltrate anti-Castro groups and manipulate U.S. media and political groups, federal investigators said Monday. One suspect was a civilian employee at the U.S. Naval Air Station in Key West, Fla.
Ana Montes was arrested in 2001 spying for Cuba. She held a key position at the Defense Intelligence Agency where she had access to the most sensitive information within government. Montes shared information with Cuba for an estimated 16 years. Montes was so valuable that she was included in a proposed spy and people swap deal under the Obama administration. In the successful effort by President Barack Obama to normalize relations with Cuba, a huge swap did happen, where Cuba received all the benefits. 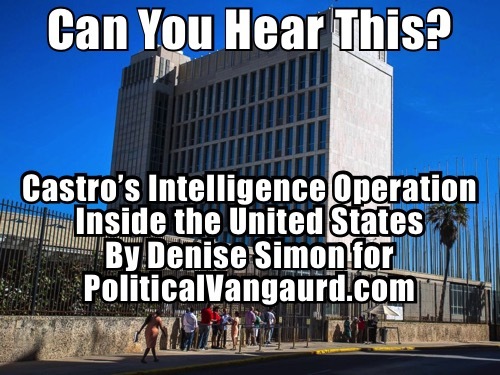 In 2009, yet another Cuban operative case was discovered and investigated at the U.S. State Department, where again very sensitive, classified and top secret information was provided to Cuba. An indictment and criminal complaint unsealed today in the District of Columbia charges Walter Kendall Myers, 72, a.k.a. “Agent 202,” his wife, Gwendolyn Steingraber Myers, 71, a.k.a. “Agent 123” and “Agent E-634,” with conspiracy to act as illegal agents of the Cuban government and to communicate classified information to the Cuban government. Each of the defendants is also charged with acting as an illegal agent of the Cuban government and with wire fraud. Kendall Myers was known as Fidel Castro’s personal spy and Hillary Clinton ordered a damage assessment to take place to determine the extent of the damage. Such a report was not forthcoming. Cuba has deployed the same information tactics as other adversarial government’s intelligence operations and that is to place recruiters and operatives in academia. As higher education employs leftist professors and the syllabus has grown more anti-West, sympathizing more with Marxism and Socialism, campuses across America are ripe incubation centers. All this brings more of a challenge to the Trump administration and to Secretary of State, Rex Tillerson, with the 15-month health scandal in Havana known as some kind of sonic weapon that has resulted in hearing loss and traumatic brain injury for U.S. diplomatic staff on duty in Cuba. Tillerson is considering closing the U.S. embassy in Cuba which is long past due. Between the corruption, the spying and the health risk to an estimated 21 U.S. personnel, what is the Trump administration waiting for to order operations in Cuba shuttered? The U.S. said in August it had expelled two Cuban diplomats from the country’s embassy in Washington, D.C., after it revealed details of the suspected attack. Donald Trump’s administration said it had taken the measure in response to Cuba’s failure to protect the U.S. officials under the Vienna Convention. U.S. officials told the Associated Press last week that the incidents had focused with “laser-like specificity” on rooms or even parts of rooms in houses and a hotel where U.S. staffers were present. The FBI, Royal Canadian Mounted Police and Cuban authorities have launched investigations into the attacks. A group of five Republican senators have written to Tillerson, requesting that the U.S. again shutter its Havana embassy, which Barack Obama opened toward the end of his presidency. One can only wonder if President Trump will do so.